Welp, that’s it for the U.S. at the World Cup: In a game that entered extra time in a scoreless tie, Belgium defeated the Americans today, 2–1, eliminating them from the tournament. Belgium dominated play for much of the match, and only the incredible play of goalkeeper Tim Howard kept the U.S. in it. Howard’s brilliance wasn’t enough, though: Belgium scored twice in extra time, and though the U.S. would show some life late, it’s Belgium that will move on to the quarterfinals, where they’ll play Argentina on Saturday. 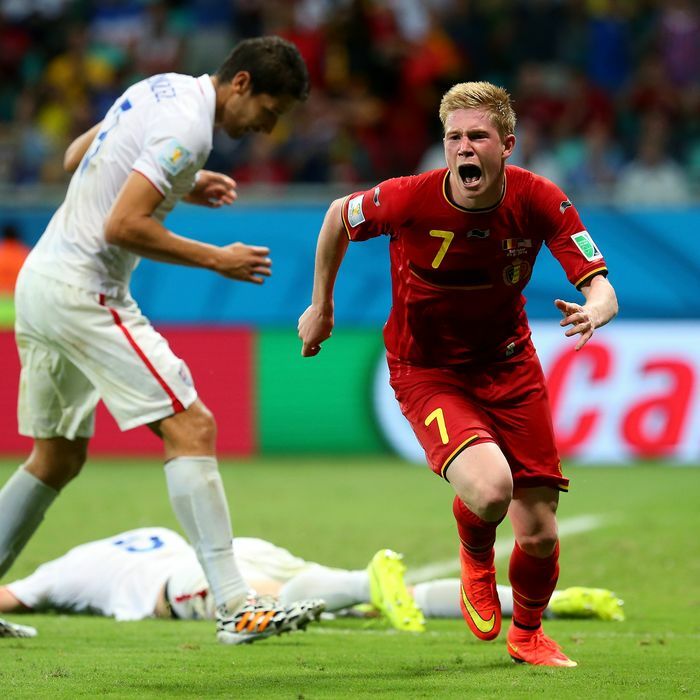 Relive the Americans’ World Cup exit with our GIF recap below. American Mohawks > Belgian ’fros. U.S. fans, both in Brazil and back in the States, were amped up, even before kickoff. Tim Howard made a huge save in the match’s very first minute. There would be many more to come. … and Jürgen Klinsmann was not pleased. The U.S. got only the occasional chance in the first half and had their hands full with Belgium, who controlled play for much of the first 45 minutes. Worse still for the Americans: Fabian Johnson had to leave the game with a hamstring injury. The game remained scoreless at the half, though. Belgium dominated play to start the second half, but still couldn’t break through. Tim Howard was awesome. Like, really awesome. Belgium fans were understandably frustrated. The U.S. finally got a good chance of its own during stoppage time in the second half. This would have been ruled offside had it gone in (though it shouldn’t have been). Either way, the game went to extra time, in a scoreless tie. … to the delight of his coach. It would get worse still: In the 105th minute, Belgium scored again, and took a 2–0 lead. The U.S. showed some life late, cutting the score to 2–1 on a Julian Green goal. But alas, it wasn’t meant to be for the U.S., and for the second straight World Cup, their run would end in the Round of 16.